I've collected at least five top games those you can download and play on BlackBerry Playbook tablet. With the design special for tablet view, you will be entertained by some of high density display and may some of them not too good, but I can feel the stunning on all BlackBerry Playbook games I provide below. Four of them made by Polarbit which famous with Reckless Getaway car racing game. Polarbit recently developed four Playbook tablet games Wave Blazer, ToonWarz,Raging Thunder,Armageddon,Angry Apes,etc. Here is the eight BlackBerry Playbook games available you can download from AppWorld. Armageddon Squadron is an action/arcade flight simulator giving players the chance to try their wings in some of the best known aircraft of the World War II era in a variety of mission types and environments. Mission objectives include bombing and strafing raids against facilities and convoys, protection of ground troops against enemy aircraft and, of course, action-packed dogfights against enemy . Download from the link I provided above. Raging Thunder is a gut-churning, tyre burning racer giving you control over the most extreme muscle cars in the world! Race against time, CPU controlled opponents or up to three other speed addicts in this fast paced and exhilarating coin-op style racing game. The greedy toucans have been stealing the apes bananas. 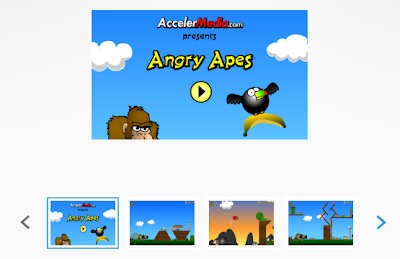 Help the angry apes scare away the birds and get back the apes' bananas! Join the fun, in the Ad-Free version of Angry Apes! Fire a cannon at the birds, filled with coconuts, monkeys, and anything else you can find. We give you choices of TWO ways to shoot the cannon! 1. Classic Slingshot - Imagine the canon is a slingshot. Touch the cannon and drag backwards to aim, then let go. 2. Single Tap - Tap anywhere on the screen to aim the cannon and shoot. Control the power of the canon by how far away from the cannon you tap. For shorter range shots, tap closer to the cannon. Remember gravity affects cannon balls too, so aim high. Pinch the screen with two fingers to zoom out. Okay, so a videogame based on building hamburgers, serving hungry customers and customizing your own personal burger joint sounds a bit unconventional. But that's also why it's so much fun. Papa's Burgeria is a unique one-player "sim" game that awards players for burger-building accuracy and serving speed, and like a great burger, it's surprisingly addictive. Download from the link I provided above. Take control of a one-man army on a death defying mission behind enemy lines. Storm the fortified enemy stronghold and fight your way to its’ very core to rescue the imprisoned hostages before it is too late. ToonWarz is a 3D action FPS featuring both single player missions and real-time multiplayer death-matches. 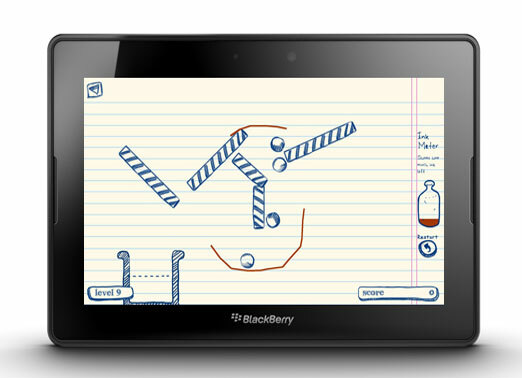 DoodleBlast for the BlackBerry PlayBook is a simple, addictive and surprisingly challenging game of skill that all RIM tablet owners will appreciate. The goal of the game is simple: A number of balls are suspended above an obstacle course, your job is to draw lines with a limited supply of ink, in order to safely direct them through the course and into a bin at the bottom of your PlayBook display. Trust me, that task is not as easy as it sounds. Download from the link I provided above. The objective: Destroy enemy spaceships by launching projectiles through galactic-environments with varying levels of gravitational pull. Sound simple? Not so much. The free version of Gravity Burst gives you 18 levels, but you can get many more stages and challenges by purchasing the full version for just $0.99. And it's well worth a dollar. 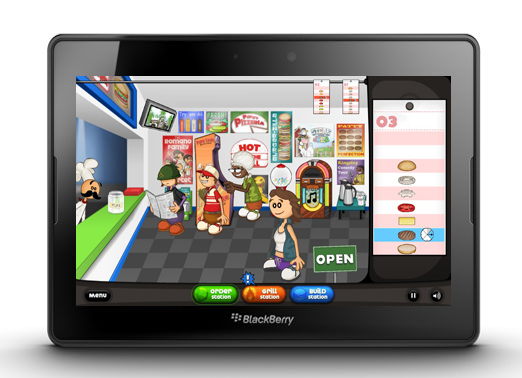 tags: free blackberry playbook games,download playbook games,paid blackberry playbook games, grab free paid blackberry playbook hd games.